As I'm trying to ease sensibly back into training after a couple of viruses, and dealing with an injury, it seems a good idea to acknowledge the help I've had with my weight loss and fitness project from Craig Barkway. 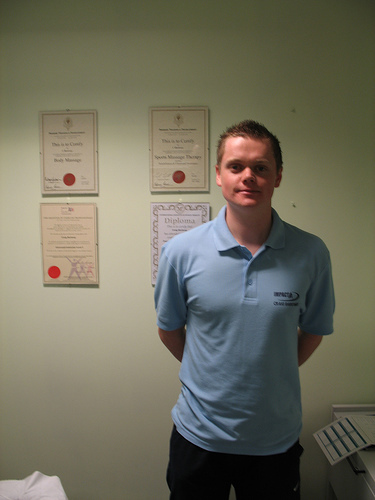 Craig is a sports physio and instructor at the Next Generation gym in Dartford, Kent. Craig has supplied an ideal mixture of practical advice and motivation. I'm sure he'll have more to do after the 'easier' pounds have come off and I start to chase some serious fitness. He puts up with my rambling explanations and my obsessive photo recording. Here he is in his treatment room – complete with certificates.